During the month of June, Lincoln Property Company partnered with CORT Furniture to provide one lucky LPC resident a complete apartment makeover valued at up to $20,000. Along with a consultation with a CORT designer, the winning resident was treated to new home furnishings and houseware items, a TV, and much more. To enter the contest, residents of LPC-managed communities were encouraged to record a 1-2 minute video about what made them choose their apartment and why they deserved an apartment makeover. We received many wonderful submissions with stories that inspired us and touched our hearts. 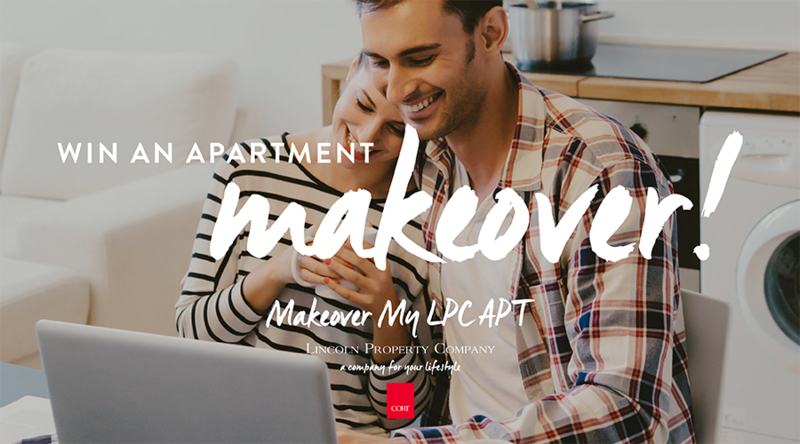 Check out the video below to hear David Spencer’s Makeover My LPC APT story! David is a resident at Enso in Atlanta, GA, and entered the contest after losing his home and possessions in a fire. He wanted to live in the same neighborhood as his former home and decided on Enso as the logical solution. Since the fire, David had been living with homemade cardboard shelves and inflatable furniture. After learning he won the Makeover My LPC APT contest, David spoke with CORT Designer, Danielle Bertz, to start the design process. She took what he did for a living, his interests, and hobbies to help create a space that was true to his lifestyle. “I’m having a hard time conjuring words. I still feel like I’m going to wake up and it’s going to have all been a dream. There’s no words to express how much of an upgrade it is in just our day to day life,” David said after seeing the completed makeover. At LPC, our business is apartments but our passion is people. Our residents are very important to us and we love hearing their stories.